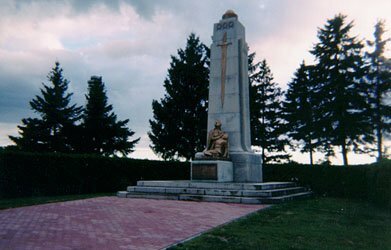 This monument commemorates the brave Shawinigan men who fell in the fields of Flanders during the two wars of 1914-1918 and 1939-1945. The monument is modeled on tombstones of ancient Greece. A bronze sword is mounted on each side of the monument, under which three crowns of laurel lie. A bronze statue of a woman carrying a dying soldier in her arms is installed at the foot of the monument. The soldier's face is partially hidden by the hands of the woman, rendering the dying man more anonymous. Facing the St. Maurice River in downtown Shawinigan, this Monument des Braves was inaugurated in September 1948. Work by Suzanne Silvercruys. The bronze statue at the foot of the monument was cast in Belgium in 1939 but the war started, and then disputes erupted about where it should be installed and about the project costs. These delayed the installation of the statue.